Can I get a gingerbread chai? Comin’ right up! The flavor is in the crumbs. Stirring root. Bon appetite. Uh it is nasty! Can I get a Big Train gingerbread chai instead? Here’s your Big Train gingerbread chai. Now that’s what I call a Big Train gingerbread chai! Serve your customers a delicious gingerbread chai latte today! Simply add the mix to a cup of hot water, and you’ve got a tasty beverage in no time at all! Hello, I’m Andrea and I’m going to show you how to make Big Train’s famous chai tea latte 2 ways, hot and iced. Big Train has a variety of beautifully rounded chai flavors, but I’m going to use the newest flavor additions, tropical and caramel in this demonstration. Let’s start out by making the traditional hot chai tea latte, with the caramel chai flavor. This is a very easy recipe. Simply take a quarter cup or 27 grams of the caramel chai mix and add it to 6 ounces or 180 mL of hot water or milk. Now stir this until the mix is completely dissolved. Mmm, I can already smell the caramel. This is a perfect way to start your day. Another great way to enjoy a chai tea latte is iced. For this recipe I’m using the new tropical chai flavor to create a fruity, creamy, refreshing drink. To begin I’m going to take a half cup or 54 grams of the tropical chai mix and add it to 7 ounces or 210 mL of hot water or milk. Now stir until the mix is fully dissolved. Now pour over a tall glass of ice. And there you have a delicious, iced, tropical chai tea latte. And that is how you make the famous Big Train chai tea latte either hot or iced. For more information on chai flavors and other Big Train beverages, go to bigtrain.com, facebook, or twitter, and thanks for watching. Give customers a delicious chai tea latte either iced or hot with the Big Train chai tea latte mix! Simply stir the mix with water and you’re ready to go! Indulge your customers in the soothing, warming effect of chai with this Big Train gingerbread chai tea latte mix! With a name symbolizing strength and constant motion, Big Train has expanded into a global foodservice brand you can trust with a large number of diverse products to choose from. Big Train has become a leader in the specialty beverage mix industry, delivering easy-to-make and consistently-delicious products. Increasingly popular beverages, chai lattes feature a spiced blend of milk and tea that is sure to delight your guests! Creating the perfect chai takes time, experience, and knowledge of spices. Make decadent chai tea lattes with this powder based mix that allows you to just add your choice of water or milk! Better yet, this chai tea latte mix features gingerbread flavor that's perfect for the winter season or for holiday specialties. Made from invigorating black tea and exotic chai spices, it also includes a sweet blend of honey and ginger. This chai tea latte mix is perfect for guests who prefer the taste of tea over coffee. It can be prepared hot, blended, or iced. Serve as a hot latte or blended as a cool frappe topped with whipped cream, and delight all of your guests! They can rest assured that this mix is gluten free, trans fat free, and contains no hydrogenated oil. This mix is perfect for sprucing up the menu in your coffee shop or cafe in order to offer profitable, creamy, decadent drinks with gourmet gingerbread chai taste. This chai tea latte mix adds alluring flavor to your signature drinks, while satisfying your patrons' cravings for something sweet and new! Blended: For a 16 fl. oz. (480 mL) blended drink, add 6 fl. oz. water or milk to blender. Add 2 scoops drink mix. Add 1 1/2 cups ice. Blend until smooth. Iced: For an 8 fl. oz. (240 mL) iced drink, combine 2 scoops (6 tablespoons) of Chai mix with 5 fl. oz. (150 mL) of hot water. Stir rapidly until dissolved. Pour into a 16 oz. cup filled with ice, then add 2 fl. oz. (60 mL) of cold water or milk. Stir and enjoy! Hot: For an 8 fl. oz. (240 mL) hot drink, add 1 scoop drink mix to cup or mug. Add 6 fl. oz. (175 mL) hot water or milk. Stir to dissolve. The flavor is good its more of a once in awhile request. Around the holidays and winter months its a big hit and its a quality product. This is an amazing addition to any coffee shop around the holidays. The gingerbread chai tea latte was a Huge hit at ours and will for sure be back on the menu when the holidays come around again. Added this flavor of the popular CHAI TEA LATTE to our winter menu and had an awesome following from our usual chai drinkers. Its nice to have a little variety and this tasted great. Makes you feel warm and cozy. This is a really delicious chai tea flavor. It is the perfect fall and winter flavor. It mixes easily and the large size keeps you well supplied for the cooler months. This flavor was a huge hit for fall! You can use this hot or cold, we chose to do frozen drink and it went over quite well. 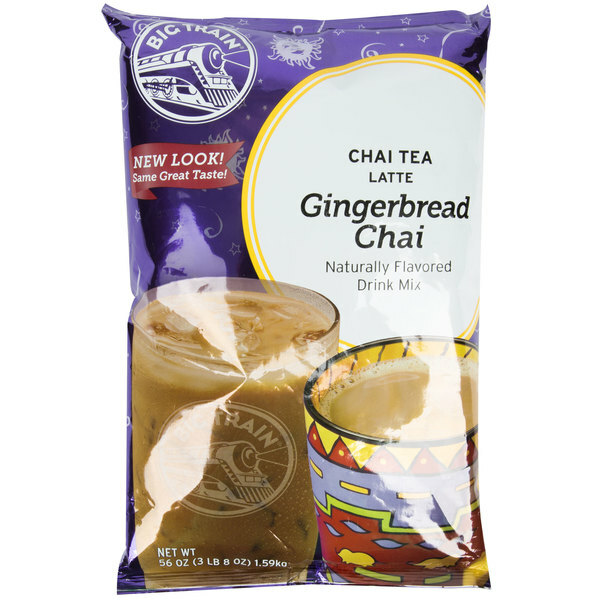 The Big Train gingerbread chai mix is a customer favorite for the holiday season. It is a fun way to try a new drink but still have the familiar chai flavor in it. The Big Train gingerbread chai tea latte mix is great and a wonderful seasonal option. The gingerbread taste is rich and perfect. I love the great taste of molasses and clove and the final product is wonderful. The Big Train Gingerbread Chai Tea Latte is Creamy and delicious. It has the perfect blend of gingerbread and Chai. Highly recommended for any restaurant. A must have for wintertime. The Big Train gingerbread chai tea latte mix is a fantastic flavor that is decadent and nostalgic. I love it served hot with milk. 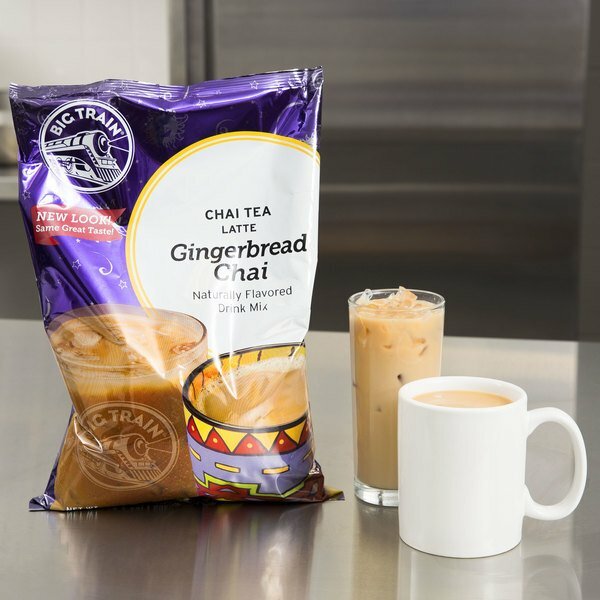 If you love Gingerbread flavor as much as I do, you are going to simply LOVE Big Train Gingerbread chai tea latte mix in the 3.5lb bag. Yummy, this is yet another tasty Big train latte mix. It is the time of year for gingerbread but stock up to make certain you can enjoy this one throughout the year.